Stern view of USS Harder, Mare Island Navy Yard, Vallejo, California, United States, 19 Feb 1944 USS harder at Mare Island Navy Yard, Vallejo, California, United States, 19 Feb 1944, photo 1 of 2 Submarine USS Harder backing away from the reef off Woleai, Caroline Islands, 1 Apr 1944; note SOC Seagull seaplane off Harder’s starboard quarter and rescued aviator Ensign John Galvin in a raft off the bow. 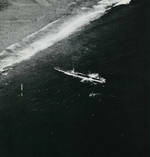 Submarine USS Harder with her bow against the reef off Woleai, Caroline Islands, 1 Apr 1944 as a rescue party went ashore to rescue aviator Ensign John Galvin on the beach. Note SOC Seagull seaplane.